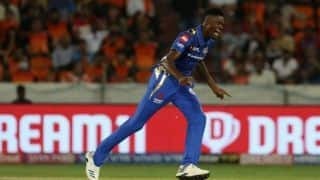 Mumbai Indians trumped the hosts Sunrisers Hyderabad at the Rajiv Gandhi International Stadium, Hyderabad with a 40-run win in Match 19 of the IPL 2019 on Saturday. 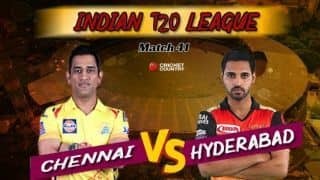 Mumbai should consider themselves part lucky to steal two points in Hyderabad, but credit should also be given to Rohit Sharma for his tactical moves, defending a low total by IPL standards. The fact that Mumbai managed to post a decent total, owed largely to Kieron Pollard late flourish of 46* off 26 balls that saw Mumbai ransack 39 runs off the last two overs. 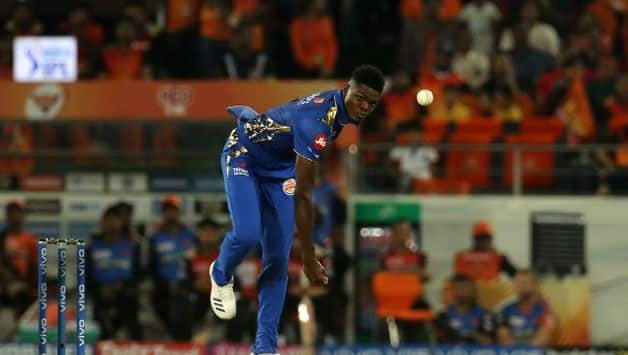 But this game was won by the bowlers and leading from the front was IPL debutant, West Indian young pace sensation Alzarri Joseph, who returned a sensational 6/12 on debut -the best-ever figures in IPL history. 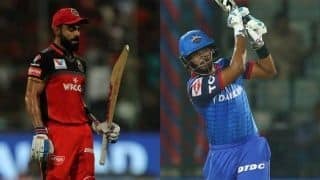 After Bairstow (16) fell to an over-confident shot when he tried to go straight down the ground to a tossed up delivery from Chahar, Joseph, introduced in the fifth over, got the big fish Warner (15) – playing one on to the stumps flashing hard outside off – off his first delivery of the IPL. And suddenly, a chasable target, looked daunting. India international Vijay Shankar (3) threw his wicket away going for a hard swipe to hand Joseph his second wicket in his second over. With the inexperienced middle-order of Hyderabad exposed, it was Mumbai’s time to drive home the advantage, and they did that with a tidy overs in the middle from the Pandya brothers. Manish Pandey (16) succumbed to the pressure hitting one straight to mid wicket off Jason Behrendorff. Yusuf Pathan (0) was then undone by a top-spin from Chahar, top-edging a sweep to deep square leg. 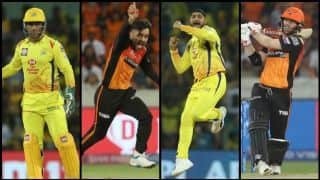 Mohammad Nabi and Deepak Hooda (20) kept Hyderabad in the hunt before Joseph took center stage claiming Hooda and Rashid Khan in on over and then finished off game with two more in his final over to bundle out Hyderabad for 96. 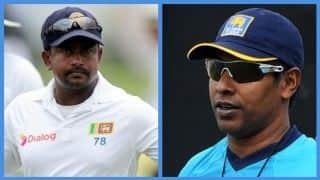 Their three-match winning streak was halted, losing the match by 40 runs. Earlier, Hyderabad bowlers put in a good performance to limit the visitors to below par total. 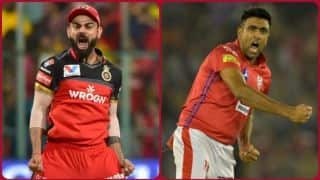 While the spin of Nabi and Rashid gave away just 40 runs in their eight overs, the domestic bowlers – Siddarth Kaul and Sandeep Sharma – returned three wickets between them at an economy of 6.66 and 8.50, respectively. 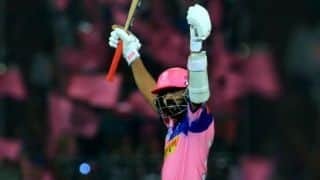 That Mumbai got to a respectable total, and eventually a match-winning one, owed largely to Pollard’s late hitting in which he hit three sixes off Kaul and added two fours and a six off Bhuvneshwar. Rashid had dropped Pollard in the 18th over when the big West Indian was just on eight. 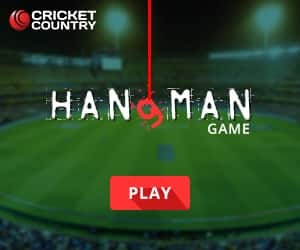 After being put in to bat, Mumbai lost Rohit Sharma in the powerplay overs for the third time in four matches, when he sliced one off Mohammad Nabi to deep square leg fielder Hooda. 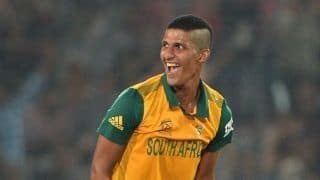 Quinton de Kock got going, but once again, failed to convert the start and was holed out at deep midwicket off a slower one from Sandeep in the ninth over. Mumbai’s in-form batsman Suryakumar was earlier trapped in front by Sandeep in the fifth over for seven. Krunal and Ishan Kishan, playing in place of Yuvraj Singh, tried to revive the innings, but both fell in the space of two runs. The senior Pandya was taken by surprise by a sharp bouncer from Kaul, that was taken easily by Bairstow behind the stumps for six. 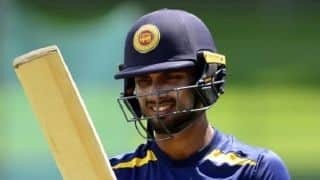 Kishan found himself stranded after being sent back by Pollard and despite Bairstow dislodging the bails while taking a Vijay Shankar throw, he had the wherewithal to uproot the stumps and Kishan was gone for 17. SRH skipper Bhuvneshwar got Rashid in only at the 13th over and he bowled all of his four overs at one go. 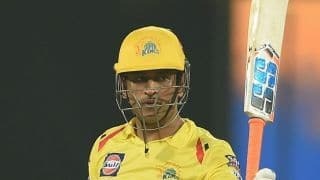 Off the last over, he got the big wicket of Hardik Pandya- after being hit for a six – caught at deep midwicket. 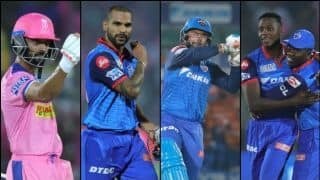 Brief Scores: Mumbai Indians 136/7 (Kieron Pollard 46*, Quinton de Kock 19; Siddarth Kaul 2/34) beat Sunrisers Hyderabad 96 (Deepak Hooda 20; Alzarri Joseph 6/12) by 40 runs.